Home Calendar Software  180+ Design Templates, Ready to Use! Want to design calendars at home? 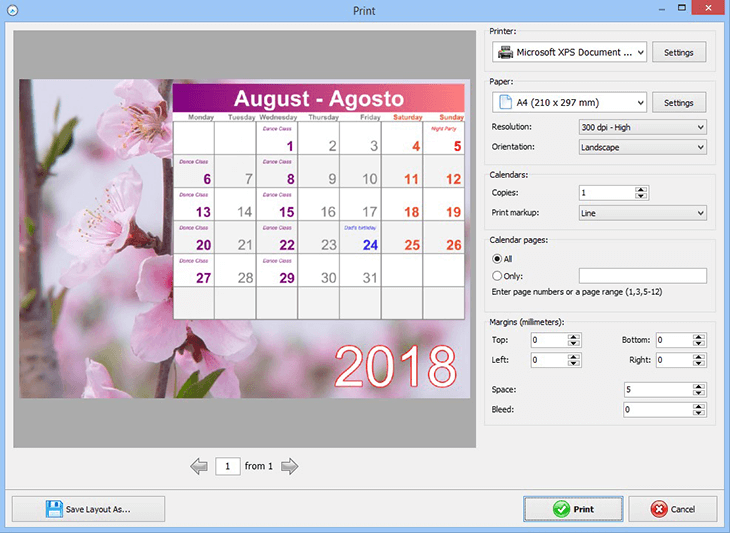 Tired of going to a print shop every time you want to create and print a calendar? Wish to make your own designs using your computer right away? Who would refuse such an offer? A homemade calendar could solve this problem once and forever. Ready to say goodbye to print shops? Keep on reading and learn how to do everything at home! Convenient software usually offers a vast collection of ready-made templates. 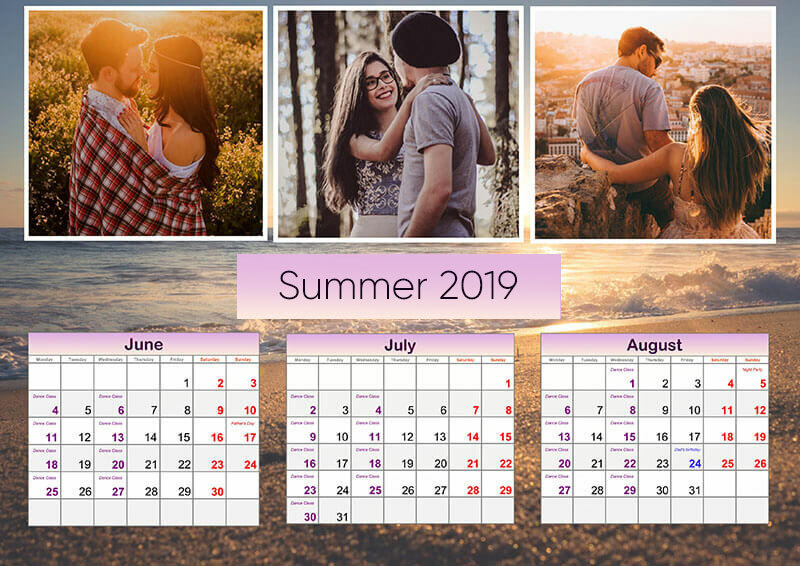 Want to design a homemade photo calendar all by yourself? Then the templates should also be fully customizable. 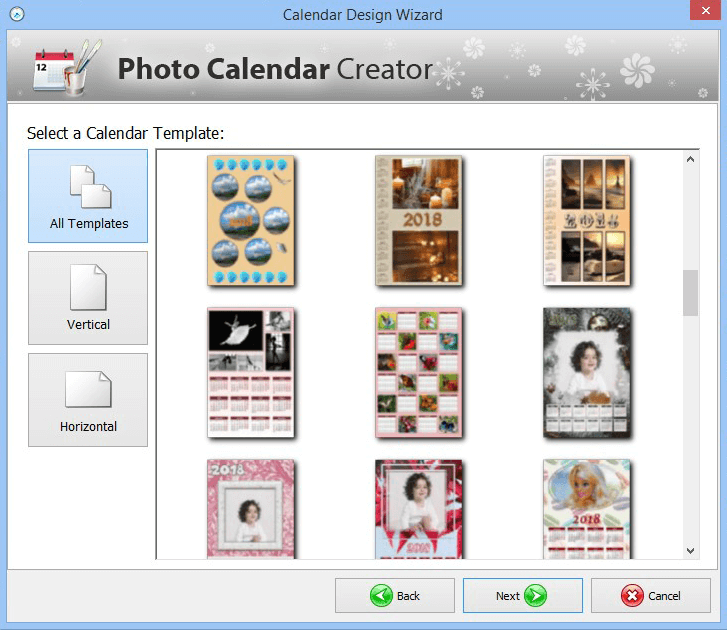 For example, use a winter-themed one to create stunning calendars for Christmas. Decorate them with photos, clipart and add congratulations using stylish fonts! 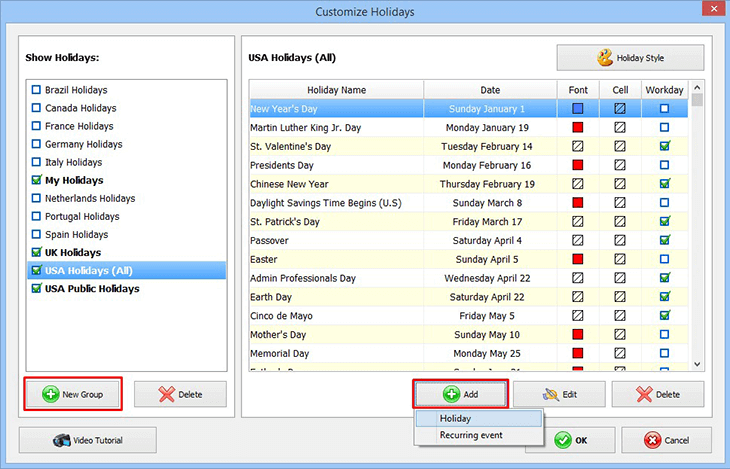 If you want to add your own recurring events and new groups of holidays, then search for software with an editable holiday database. Plan to work out regularly, need to attend a meeting or want to remember a date? No problem, just click Customize Holidays to edit the database. Adjust the color, font and type for each event. Have a problem reading small text? Open the cell settings and add different pictures to spot the important date at once just by casting a glance at your calendar. Want to check lunar phases with your calendar? The Moon Phases feature will help you to do that. For instance, if you’re addicted to gardening, you can make plans on when to plant seeds, when to water and fertilize them. To add moon phases to your homemade calendar, hit Calendar > Customize Moon Phases. You can also insert additional lunar phases if needed. The oldest lunar calendar is over 10 000 years old. It is located in Aberdeenshire, Scotland. Have a lot of friends abroad? Need to create a bilingual calendar? Say “no” to manual translation! 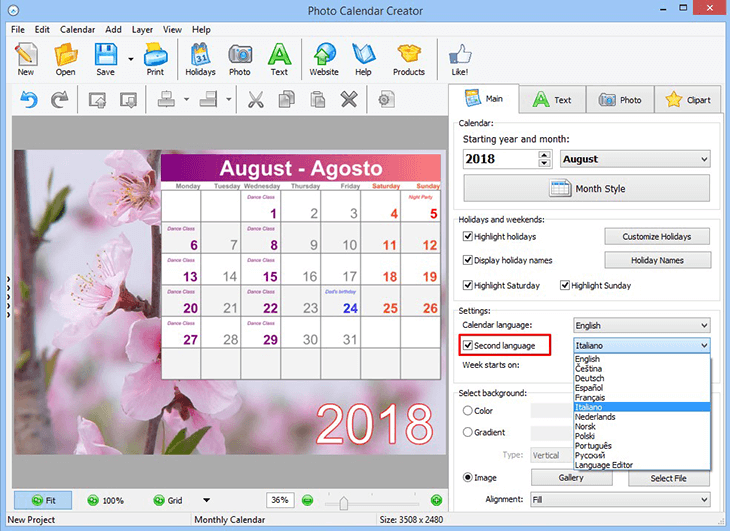 Search for home calendar software that supports multiple languages. For example, make a calendar in English and French simply by checking the Second Language box. If you need another language, you can easily switch between them or add a completely new one via Language Editor. If you prefer using custom paper sizes, then you definitely need this feature. You will be able to change the calendar size any time, even if you’ve finished working on the design. What’s more, you won’t have to visit the local print shop and waste your time. Design, create and print your DIY photo calendar right at home! Now you know what to look for when searching for a good calendar maker. If you don’t want to waste any time, download Photo Calendar Creator that has all these features. 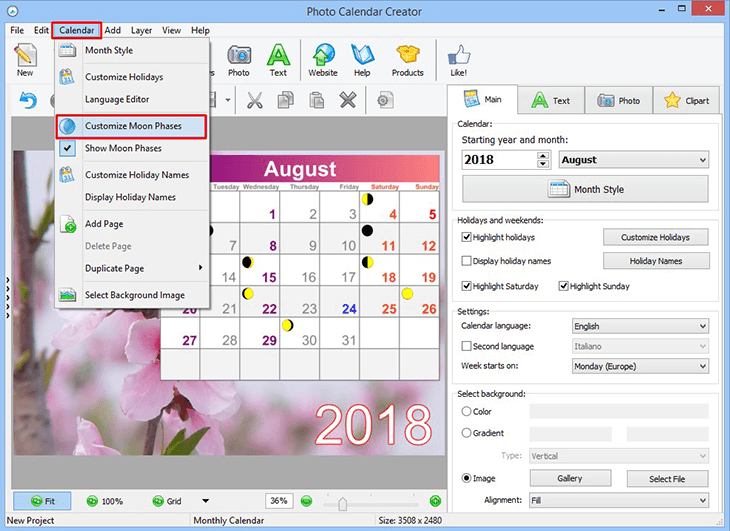 You will be able to create different calendar types, edit the holiday database, add moon phases and much more! Also, be sure to check out this step-by-step guide on how to make a homemade calendar. These tips will help you create the calendar of your dream in just a few clicks!